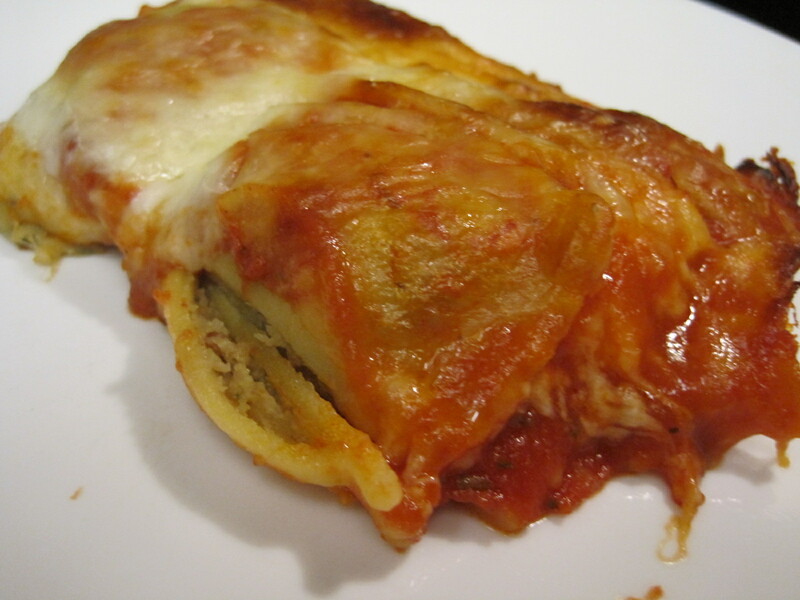 I got the idea for this recipe from a $14.99 package of “ravioli lasagna” that I saw in the closest warehouse store. It was in section of the store that has pre-packaged food that’s prepared in the store’s kitchen. It looked delicious, but I couldn’t bring myself to spend that much money for something that looked so simple. I’m not condemning people who buy those types of foods. Purchasing prepared foods is definitely more cost effective than taking your family of four out to eat at an Italian restaurant. It just wasn’t the right choice for us. This recipe came in at under $1.00 per serving with the ingredient’s that I selected. I used store brand ravioli to make this. The name brand Ravioli cost $4.18 for the same sized bag compared to $2.99 for the store brand. I didn’t feel that there was that much of a taste difference between the two different brands, so I chose the least expensive. All you need to do to have dinner on the table is layer all of the ingredients in the pan, cover it with foil, and toss it into the oven. 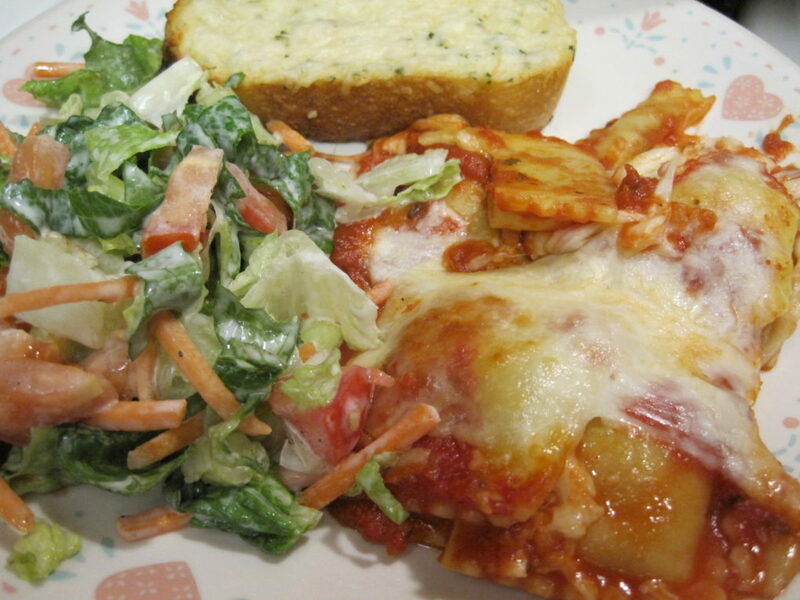 When the Baked Ravioli Casserole is almost ready, remove the foil, toss together a green salad, and broil some garlic bread. It’s really that simple to get dinner on the table. 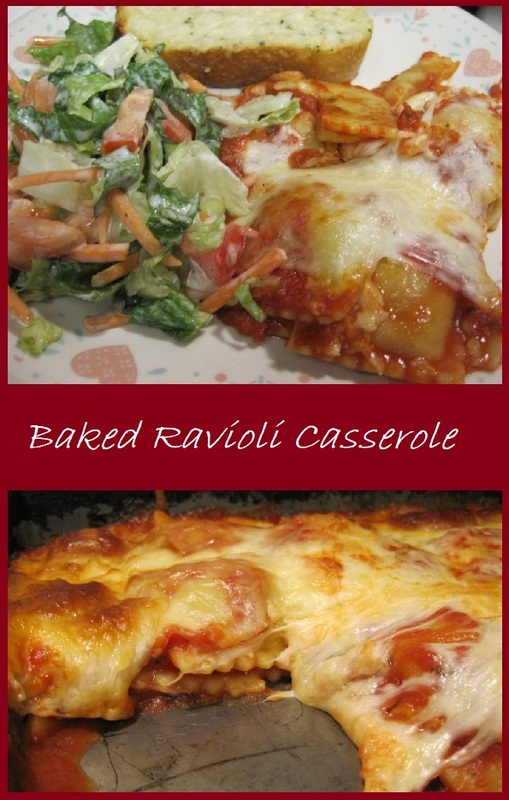 Give our recipe for Baked Ravioli Casserole a try and let us know what you think by leaving a comment below. Frozen ravioli is layered in a baking pan with spaghetti sauce and shredded cheese for a simple and delicious dinner that's sure to become a family favorite. 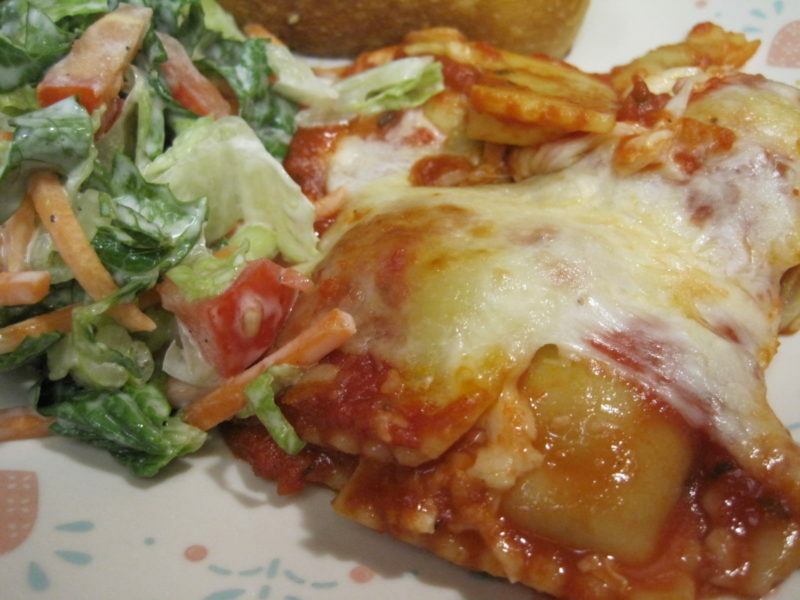 Cook's Note: I recommend using a metal baking pan for this due to placing frozen ravioli into the hot oven. 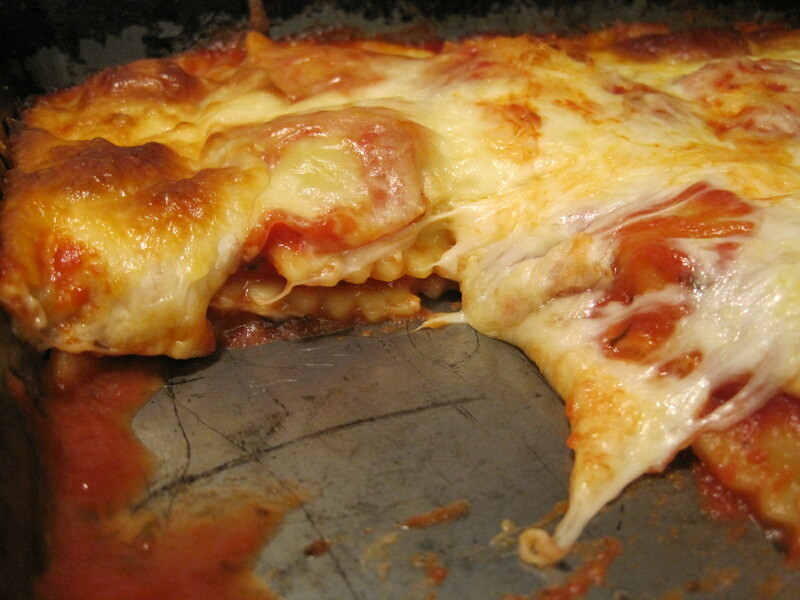 Occasionally, a glass pan that contains frozen food with break in a hot oven. I'd rather be safe than sorry, so use a metal pan. Total Cost or recipe is $5.54 or about $0.93 per serving. Spray a 9 by 13 inch metal baking pan with non stick spray. Spread 1 cup of the spaghetti sauce over the bottom of the pan. Pour frozen ravioli into the pan and spread them evenly. Pour the remaining spaghetti sauce over the ravioli trying to evenly distribute it on top of the ravioli. Sprinkle the shredded cheese evenly over top of the pan. Remove the foil and bake for an additional 15 to 20 minutes or until all of the ravioli is heated through. This was so easy to make, and it was delicious. The serving size is very generous. We had it with salad and garlic bread. It was amazing. I’m definitely making this again. I’m so glad that you liked this recipe. It is simple to make, but it tastes sooo good.